Thisdayonline has reported that after over three weeks in detention, reprieve finally came the way of some of the bank chiefs sacked recently by the Central Bank of Nigeria (CBN) over the huge non-performing loans of their banks and other alleged infractions. 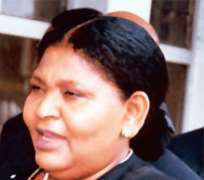 Those granted bail yesterday by a Federal High Court in Lagos were former CEO of Oceanic International Bank, Mrs. Cecilia Ibru, and her former Union Bank and Afribank counterparts, Bartholomew Ebong and Sebastian Adigwe, respectively. But the bail conditions are a far cry from the terms set for their release by EFCC two weeks ago, and which none of the accused persons could meet. Others admitted to bail included two directors of Union Bank, Mr. Niyi Opeodu and Mr. Henry Onyemem, and Managing Director of Falcon Securities Limited, Mr. Peter Ololo. The six were among the 15 bank chiefs arraigned on August 13 by EFCC on a total of 131-count charge bordering on fraud, concealment and granting of loans without adequate collateral running into about N700 billion. The presiding Justice Dan Abutu in separate rulings admitted each of them to bail at N100 million and two sureties in the same amount. The judge further directed that both sureties must be Nigerians who must reside in either Lagos or Abuja. Justice Abutu added that one of the sureties must either be a serving Senator, House of Representatives member or a chairman, board of directors of a reputable financial institution in the country with head office in Lagos or Abuja. Such institution's total asset, as disclosed in its annual report of the year ended 2008, must not be below N1 billion. The judge added that such surety could also be a chairman, board of directors of an oil producing or oil services company with total asset not below N1 billion as at last financial year. Justice Abutu gave further options to include “a reputable former holder of the office of an Executive Governor of any state in Nigeria, a reputable former Senator with landed property in Ikoyi, Victoria Island or Lekki in Lagos or Asokoro, Maitama or Garki in Abuja”. Further, the court said one of the sureties could be a Speaker or Deputy Speaker of the House of Assembly of any state in the country and who must possess landed property in Ikoyi, Victoria Island or Lekki in Lagos or Asokoro, Maitama or Garki in Abuja. Justice Abutu barred the accused persons from travelling out of the country during the pendency of the case. He ordered each of them to report to the officer who investigated his/her case at the EFCC headquarters, Abuja on the first working day of every month pending the conclusion of their trial. The judge gave EFCC 48 hours; from the time an application is submitted by any person who wants to be the surety for any of the accused person, to verify the person and authenticity of the documents submitted to ascertain the person's eligibility. He hinged his decision on the fact that there was no convincing evidence to either show that the accused persons if granted bail would escape or interfere with prosecution's witnesses as alleged by EFCC. Justice Abutu noted that the object of bail was to secure the attendance of the accused persons in court to stand trial. He said what is crucial in any condition for bail is that it must be driven by the need to ensure the accused is available for trial. “They (conditions) are such that are reasonably necessary to ensure their (the accused persons) appearance in court,” he said. He then adjourned hearing in the case involving Ebong, Onyemem and Opeodu to November 23, while fixing that of Ibru for November 25. Hearing in the case of Adigwe, Ololo and Fountain Securities was adjourned to November 26. However, the court will decide the case of former Finbank Plc Managing Director, Mr. Okey Nwosu, and seven directors of Intercontinental Bank Plc today. The bank chiefs, according to the charges preferred against them, were alleged to have committed offences contrary to and punishable under Sections 20(b) (7), 28 (1, 2, and 3), 24 and 50 of the Banks and Other Financial Institutions Act (BOFIA) Cap B3, Laws of the Federation, 2004; Section 422 of the Criminal Code Act, Cap C38 Laws of the Federation, 2004. Some of them, especially the CEOs and directors were accused of failing to give true and fair view of the state of the affairs of the bank to CBN. Part of the charges filed against the directors of Intercontinental Banks include taking $10,000 as holiday allowance in contravention of the code of conduct for banks issued by CBN. EFCC counsel, Mr. Abubakar Mahmoud (SAN), had opposed the directors' applications for bail, arguing that the offences for which they were being tried were very grave and border on economic sabotage and threats to the economic health of the nation. Besides, Mahmoud told the court that EFCC had incontrovertible evidence to the effect that many of the suspects, if admitted to bail, would interfere with the trial by “influencing prosecution witnesses”. He also disclosed the preparedness of the commission for the speedy trial of the suspects, praying the court to discountenance claims made by some defence counsel about the ill-health of one of the suspects. He said the suspects were receiving adequate medical attention from the commission. But the defence counsel hinged their arguments for bail on the fact that the offences for which all the suspects were being tried were bailable. They also prayed the court to grant them bail on “very liberal conditions”. Also yesterday, the absence of Justice Ibrahim Auta of the Federal High Court, Lagos stalled further hearing in the N50 billion suit instituted by Akingbola, against CBN and its Governor, Mallam Sanusi Lamido Sanusi. No reason was given for the absence of the judge but a source close to the judge said he was still not back from a workshop he attended abroad last week. The case was, however, adjourned to September 24, 2009. The immediate past Chief Judge of the Federal High Court, Justice Abdullahi Mustapha, had re-assigned the case to Justice Auta following disagreements among counsel as to how preliminary objection against Akingbola's suit should be taken. Akingbola's counsel, Chief Felix Fagbohungbe (SAN), had informed the court that since he had been served the preliminary objections separately filed by CBN and Sanusi, the court should take the preliminary objections alongside the substantive application. But counsel to CBN and Sanusi opposed taking all the application together since the issue of jurisdiction had been raised, it must first be addressed. Akingbola had gone to the court to challenge his removal as Intercontinental Bank CEO. He is seeking N50 billion as damages. Besides, he sought the court for an order declaring that the joint CBN/NDIC ad hoc assignment conducted on the books and affairs of management headed by the applicant as Group Chief Executive of Intercontinental Bank Plc, is not a “Special examination” as required by the Banks and Other Financial Institutions Act, Cap. B3, Laws of the federation of Nigeria, 2004. One of the lawyers of Intercontinental Bank Plc, Mr. Kunle Ogunba, who was arrested by EFCC last week over the ongoing investigation into the activities of Akingbola, has, however, denied having any private or personal dealings with the bank or Akingbola. According to the lawyer from whom EFCC alleged to have recovered some incriminating documents, the documents taken away from his office were in connection to his appointment as Receiver/Manager of Ascot Offshore Nigeria Limited. Ogunba said yesterday: “I was appointed as the Receiver/Manager for Ascot Constructors (Offshore) Limited on October 30, 2008. I state that due to my vigorous activities in this company, a term of settlement was filed in Suit FHC/L/CS/25/2009 with a schedule of payment which was made the judgment of the court.